Most lavender are grown from cuttings however you can harvest seeds from some varieties...mainly the Lavender "angustifolia" varieties. To harvest seeds, wait to cut the flower stems and flowers off until after they have finished flowering. This means the spent buds have no more colorful flower petals on them. It won't hurt to wait until some of the older flower heads have begun to lose seed (tiny black seeds) before collecting the rest of the spent flowers. This helps to ensure that the seeds are ripe when you gather them. To remove the flowers from the plant, cut the flowers above the woodier/brown part of the stem. Then tie the stems together at the base in bunches with a string, making sure the stem bottoms are all facing the same direction. Put each bunch, stem side up, in a paper bag and tie it shut. It is okay if the stems stick out of the top of the bag. Store the bag in a dry place for one to two weeks. You can hang the bag upside down if you like. When the plants are totally dry, shake the lavender in the bag to help release seeds. Then empty the contents from the bag over a light colored, flat surface. This way so you'll be able to see to separate the tiny black seeds from the other plant parts. Slide your fingers down each stem to strip off the buds and other seeds that are inside the buds. You can rub the flower heads between your fingers to separate the rest of the seeds from the spent flowers. If you want to store the seeds to plant later put them in a sealed jar or envelope and store them in a cool, dry, dark place. 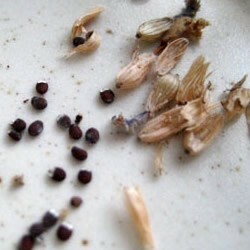 The seeds don't keep too long so you'll probably want to plant them sooner than later.